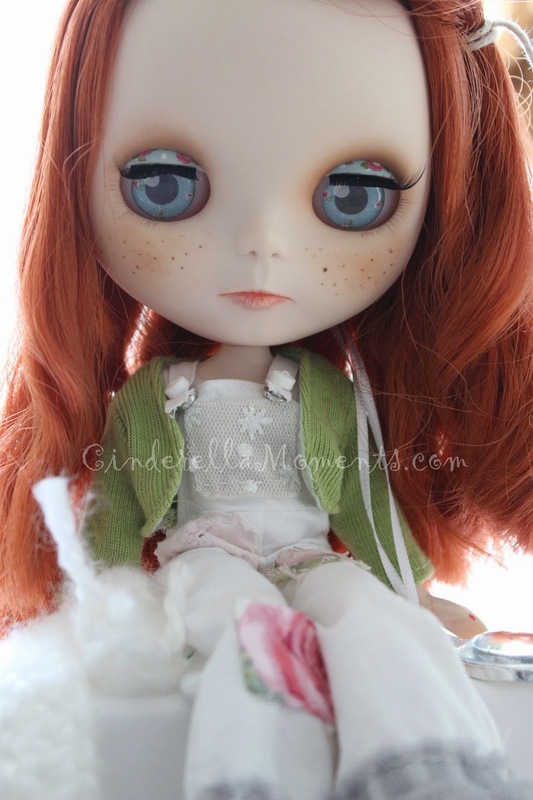 This is Abigail my newest customized Blythe doll. She was commissioned by Marie. She stands 12" tall. 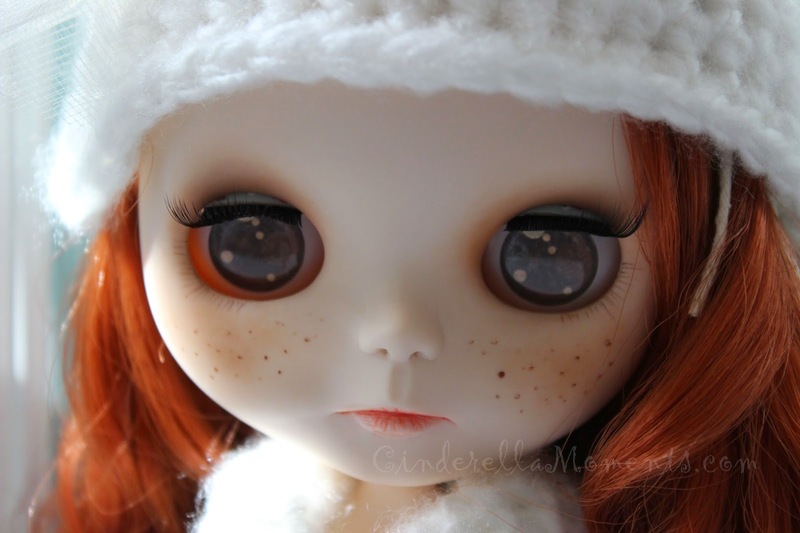 Abigail started out life as Blythe doll greatest circus performer Zinochika. I kept her beautiful hair that she came with. I just gave her a little hair cut. 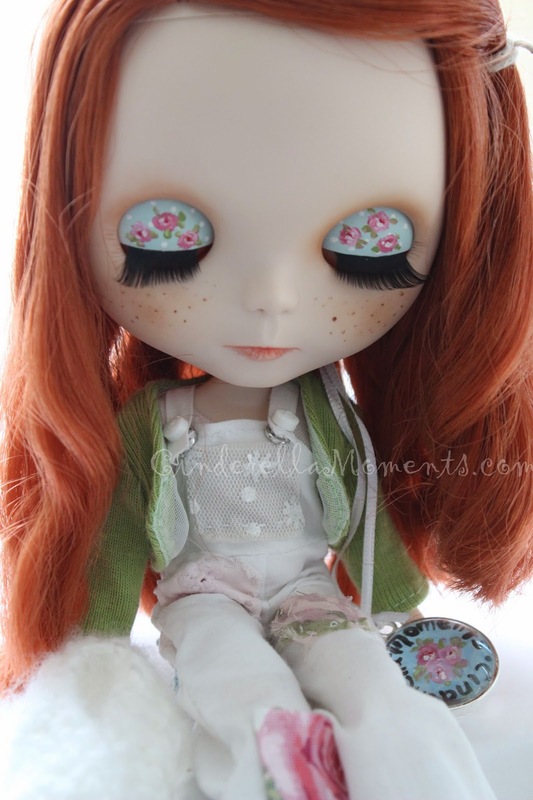 Her eyelids were painted and she has new eyelashes. Her eyes were boggled/gaze corrected and she now has sleepy eyes. Sleepy eyes means her eyes stay closed. You have to pull the second string to open them again. Abigail's nose, philtrum and lips were carved. 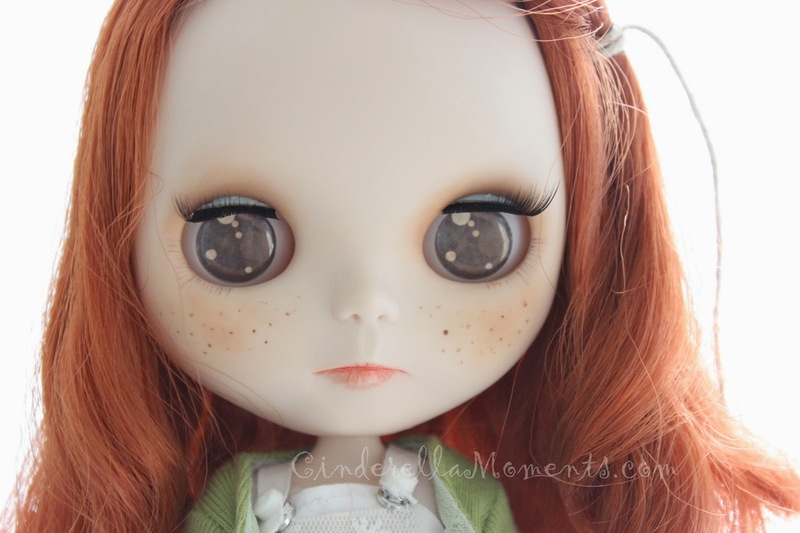 Her face has new makeup and freckles. 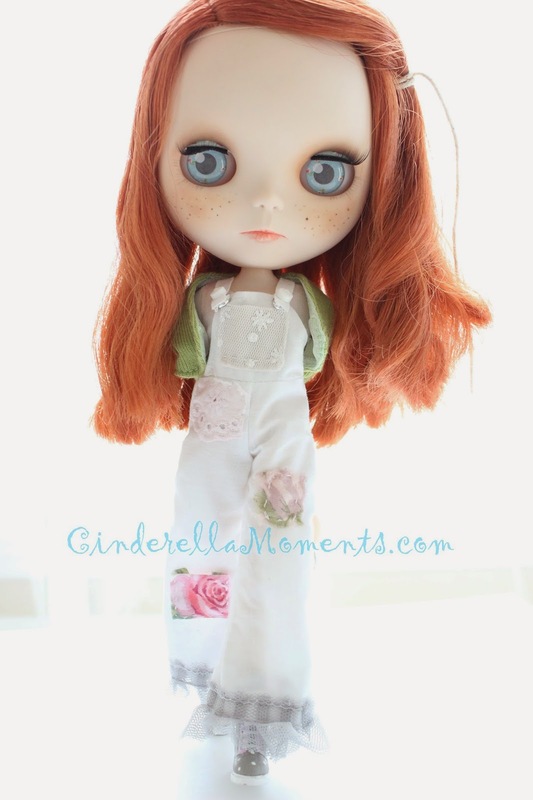 I made her overalls, a t-shirt, new pull and boots. 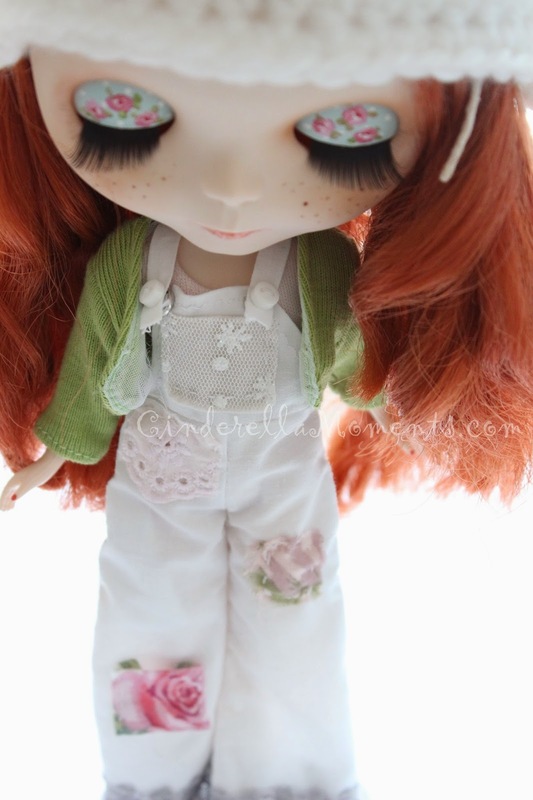 Her cardigan came from another Blythe that I made over. I also made her a scarf and hat. Abigail has 4 different eye colors. Thanks for coming over to meet Abigail! She is just so beautiful.....how precious. You amaze me every time I see one of your creations! Abby is so precious. I don't know how you do it. I stop by frequently to see what you are up to and to see how you are coming along on your newest dollhouse. You give lots of good ideas. I love her little lips and the color of her hair! She is wonderful and I love her! So pretty doll and dresses! Like the hood too, Caroline! hello, do you want to participate in my "international Christmas swap 2014" ?? come and see me on my blog, I'll wait !! kisses from Italy !!! Es tan guapa....con ese tono de pelo maravilloso,sus preciosos ojos y su vestimenta tan dulce!!!!! She's adorable. I love how you dressed her and I love her eyelids. Very pretty doll and accessories! The green eyes fit perfectly at her red hair, Caroline, she is a beauty! And I love the way you have dressed her :D! Las muñecas son preciosas, pero después de pasar por tus manos ya son increibles. Haces un trabajo excelente con ellas. She is really cute. I love what you do with these dolls. Am in love with your Wiltshire cottage, oh my goodness, so adorable. Loved everything about it. 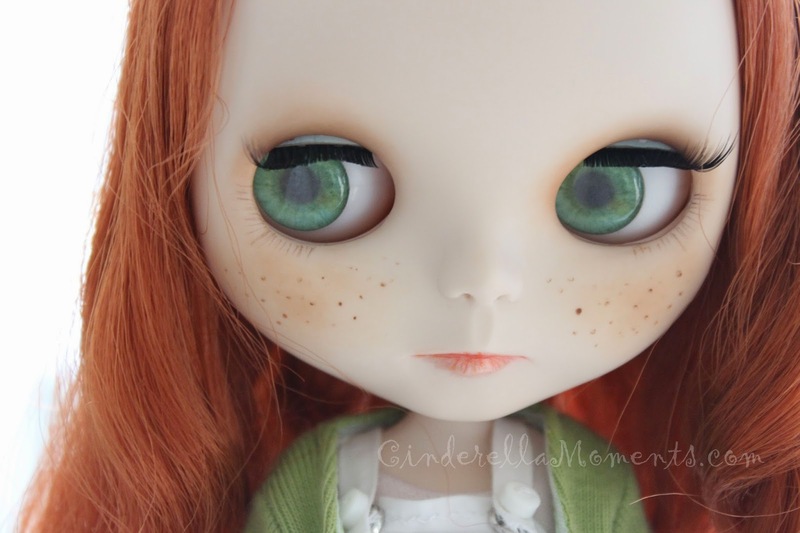 She's beautiful with green eyes, this colour goes so well with her hair.